It seems that the media loves to reminisce. Over the past few weeks I've read, heard, and saw hundreds of top-10/top-100 lists depicting the best/worst of 2009 and of the past decade. Everything from iPhone apps to music to sociological phenomenons to scientific breakthroughs has been scrutinized and ranked. Now a little bit of nostalgia is always fun but never have I seen such a heightened sense of past-awareness. Is the future so uncertain that all we can do is wrap ourselves in the safety of previous events? This is probably a big part of the answer for mediums such as newspapers and magazines - which might not even exist by the time 2019 rolls around. But why are so many bloggers so obsessed with cataloguing the past 1-10 years? Probably because it's such an easy concept to turn into quasi-meaningful content. A ten minute search can revive my memory of nearly any concept. The 2000-2009 decade is the first to have broadband documentation of every significant moment. So top-10/top-100 lists are the perfect mix of convenience and nostalgia. Home Alone was released in November 1990, almost exactly a year following the fall of the Berlin Wall and the unofficial conclusion of the Cold War. Although it would be absurd to claim there is any sort of direct link between the fall of the Berlin Wall and the theatrical release of Home Alone, the two do have an interesting symbolic symmetry. The fall of the Berlin Wall represented the culmination of ultimate distraction. The Soviet Union was no longer able to keep a close watch over its large collection of children. All hell broke loose when some of the children were left to fend for themselves. But in the end, the innocent nature of new-found freedom prevailed (at least in the short-term). With the Holiday Season in full swing, Home Alone is now a frequent visitor to my television screen. This ageless comedy depicts the struggles of a clever 8-year-old boy as he attempts to fend off a pair of bumbling home robbers. The boy has been left alone due to the distracted nature of his extended family which has departed for a vacation to Paris. Although the movie has numerous unbelievable moments, it clearly depicts the instinctive intelligence, perseverance, and nimble nature of a modern child. This child is able to quickly learn the basics of survival. He successfully communicates with all the adults he encounters and is able to defeat the two evildoers which attempt to plunder his kingdom (the family house). Although this film is superficially simple entertainment, it is also full of quite timely and extremely relevant lessons. 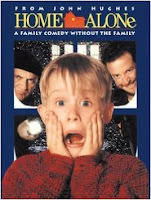 Tomorrow I will analyze Home Alone through the historical context of the Cold War. Mobile telephony has been plagued by the rumors of negative side-effects since the beginning of widespread adoption. Scientists have issued countless studies that have yielded in contradictory evidence concerning the safety of cell phones. The public perception of physical dangers has fluctuated but has never seemed to slow the proliferation of ever-more sophisticated mobile handsets and ever-more ubiquitous mobile usage. Today, it was announced that the Maine legislature is considering requiring mobile phones to carry warnings about potential negative effects - such as cancer. This would be the first time that such a public and reputable warning would be attached to mobile phones in the United States. It would conceptually make mobile phones similar to cigarettes and alcohol. Would such a warning have any influence on mobile usage? Potentially - especially if steps to minimize risk were clearly outlined - e.g. using the speakerphone option, etc. But unless these warnings are based on new, more conclusive studies, the massive expansion of mobile will not be slowed. Unless more short-term negative effects become clear, the positive efficiency impact of mobile services will continue to push further adoption. I've found myself not utilizing Twitter's services very frequently over the past few weeks. Although my schedule has been disrupted by travel and odd work-hours, the most telling sign for Twitter's potential decline is my lack of caring. No longer do I feel the urgency to view the constant glow of the Twitter stream - stemming either directly from Twitter.com or from any of the Twitter-enabled applications. Although I am just one person - whose personal habits probably have nothing to do with larger trends - it has been documented that Twitter's traffic over the past few months is stagnating. I have encountered a good deal of anecdotal evidence of similar usage trends amongst friends and family. It would be a revolutionary leap in Internet-enabled trend cycles if Twitter has indeed already crested. Only a few months after culturally peaking as the darling of Oprah, Twitter now faces a potential ceiling. Although this slowdown may be quite temporary - as was the case for other hits such as Facebook - it may also signal a deeper and more fundamental lacking of the Twitter value-proposition. The holiday season is well under way. As much of the world celebrates some sort of festivity over the next month, the themes of happiness, friendliness, and overall support are in the air. Another prominent concept permeating our psyche is the concept of giving. Although giving usually refers to material-item gifting, the most effective giving is intangible. It involves emotional and intellectual gifts. I suspect that this is the season where giving or receiving the benefit of the doubt is a bit more likely. This is the right time to throw up the Hail Mary, to take that leap of faith. I've been doing a lot of traveling lately - hence the erratic blog-posting schedule. This experience has allowed me to re-discover my general loathing of air travel. Now this is an old and worn-out topic, so let my try to take a slightly different approach. Some things surrounding air travel are annoying - e.g. the strange flight-times, the humiliating security checks, the waiting game, delays, cancellations, etc. A smaller set of air travel characteristics is frightening - e.g. the takeoff, turbulence, seeing the world from 30,000 feet, and the landing. I don't mind the annoying parts - that's the cost of productive live meetings. It's the frightening stuff that makes me question the need to fly. Although the fear-induced stress is ever-present throughout a flight, it particularly peaks during takeoff and during the landing. Clearly, the landing is the last hurdle prior to both physical and emotional relaxation. So the landing is the light at the end of the tunnel. It is the culmination of a somewhat risky relocation process. It is where the real work begins. How difficult would it be to describe flying in an airplane to someone from 1850? Pretty difficult. For someone from that era there is no relative comparison - nothing even comes close to that which can be used as an analogous description of today's air travel. How difficult would it be to describe the Internet to someone from 1900? Somewhat difficult. In the era where labor (both physical and machine-based) was king, a worldwide information network would mean very little to the common man. Yet the value of information, particularly that of the newspaper, was quickly expanding. How difficult is it to accurately imagine what radical innovation the near-future will bring? Not easy, but not impossible. We are more connected to the future than any generation before us. It is exactly the radical innovations of air travel and the Internet that make tomorrow more tangible. It's now nearly impossible for the future to hide and grow in a little, hidden cave. Since an ever-increasing portion of the wired world is on Facebook, we are quickly getting closer to having a truly universal directory of mainly real people. This directory stores quite a bit of data - in particular, nearly every member's birthday. A lot of time has been spent on the topic of fame recently. Fame is the new currency of success. Tiger Woods' life has been turned into a shamble due to fame. The White House security infrastructure was overcome by one couple's obsessive urge for fame. Two parents faked the disappearance of their son - via a seemingly dangerous balloon ride - for the sake of obtaining fame. For some, it seems that fame is now really worth more than dignity, kindness, honesty, or even sanity. Because fame has become more accessible and ubiquitous, it is no longer untouchable or unreachable. Ironically, because of cable, reality television, YouTube sensations, etc. fame is now just one (potentially absurd) step away - where some are willing to do anything to touch it, to reach it, to capture it. This increased value of fame makes digital social-media even more valuable. Beyond allowing us to connect with friends and family, platforms such as Facebook and Twitter allow us to simulate fame. These channels give everyone the ability to innocently, easily, and quickly gain a following. Facebook puts a face to this simulation. Twitter puts a number to it. When combined, we all now have the tools required to feel famous. Maps are nothing new. They've been crafted for thousands of years by men trying to make sense of the world we live in. Maps have been perfected for extreme accuracy, augmented to provide multi-dimensional perspectives, and have even been stylized into genuine works of art. Yet this age-old domain has resurfaced as a major battleground for such technology giants as Google, Microsoft, and Nokia. Why have maps become so important again? Maps were never unimportant, just little innovation in this space had made maps non-glamorous. It is innovation that has given maps new life, that has made them the darling of the next frontier. Since maps are models of the world we live in, they are the most fundamental method for tracking spacial changes - e.g. movement, construction, weather, etc. The proliferation of the mobile Internet, location-aware mobile devices (powered by GPS technology, etc. ), and powerful pocket-sized computers - i.e. smartphones - has given maps a new level of importance. When combined, the old technology of traditional maps and the new technology of completely ubiquitous real-time communication creates a powerful informational force. These new super-maps have the ability to give a rich, real-time image of the world around us. These new super-maps let us instantly find our friends, our food, our shelter. These new super-maps move humans one step closer to omnipresence. The time of gift-giving is upon us. This year's holiday season is especially prominent in mass media coverage because of the economic signals that consumer spending sends. Much will be known based on the purchasing results of this month. This time-period is also vital on a microeconomic level. Within this holiday period new products will be heavily discussed, analyzed, and rated. It will be the make-or-break time for things such as the new Amazon Kindle. So when you're standing in that long line at Macy's waiting to pay for a sweater, take comfort in knowing how powerful this potential purchase really is. This one month of magnified consumer whims will create ripple effects that will impact specific individuals, companies, industries, and even whole economies for years to come.